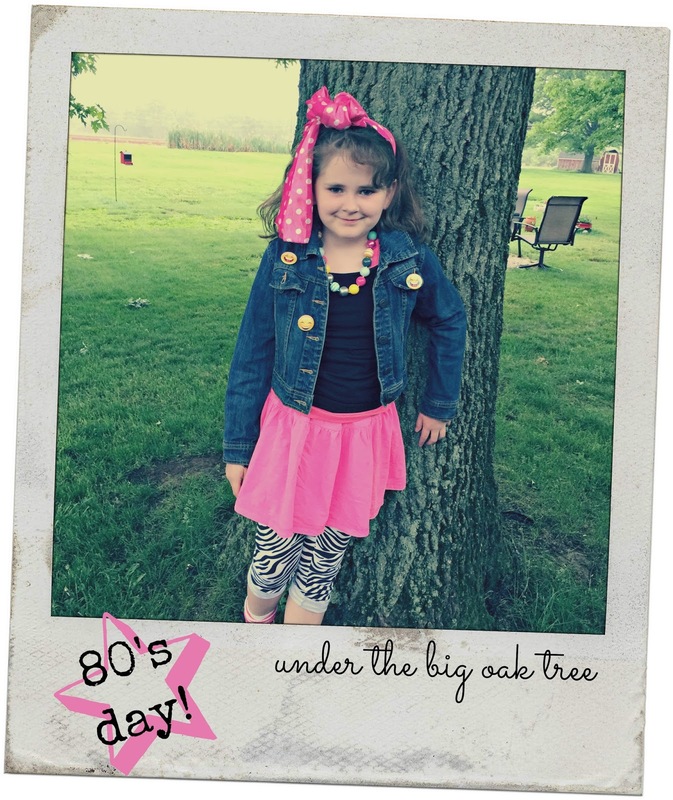 Grace's school often has theme days. Twin Day, Sports Day, Pajama Day, Dress Like Your Favorite Teacher Day, etc. Usually these theme days stress me out. I have high anxiety when it comes to stuff like this and my kid is a bit high-anxiety as well. Not a good combination. This year, the Grace's school had an 80's day! First, I laughed because most of the parents of the kids at school were either babies or not yet born in the 80's! But then, after thinking of all the possibilities, I started to get really excited! Especially, when I realized I had everything I needed to dress her up right at home. No trips to the store were needed for this theme day! When Grace told Joe about the school event, he laughed and said just a wee bit sarcastically, "Oh, you're going to have the biggest hair in the school!" It took me a little while to figure out which direction I was going to go with her outfit, but once I decided, I was thrilled with the outcome! Layered tanks, skirts, leggings, boots with socks scrunched down, pink hair chalk (instead of pink hair spray) chunky jewelry, emoji buttons on denim jacket (in place of concert pins)....I think I had a bit too much fun putting this outfit together! It's a hot one today! We don't have central air and Joe hasn't put the window units in yet since it's been really chilly up until now. 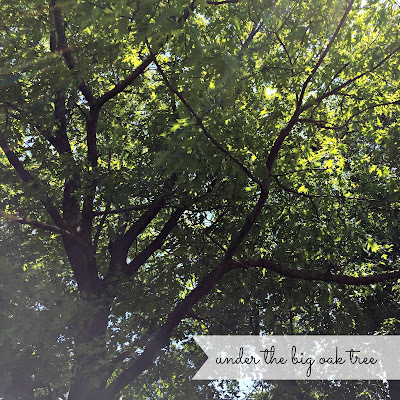 Lucky for me, our back yard is very shady thanks to our oak trees (and maple tree). I filled the dog's pool so she can wet her feet to cool off and I'm relaxing at the picnic table under the trees. Perfect way to relax on a hot day! Eating healthy is a constant struggle for me. Not because I don't LOVE healthy foods. As a foodie, I find that I LOVE food - ALL FOOD - too much! 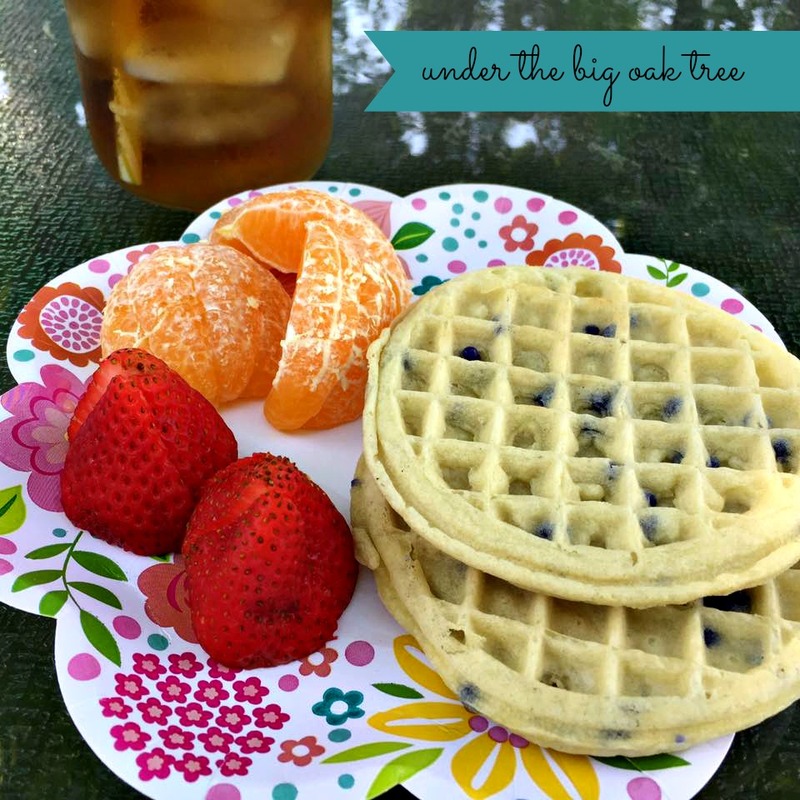 And while I do love to eat big salads and lots of fresh fruit, I find it's so much easier to grab a bag of chips or some cookies rather than chopping up some melon or digging through the fruit drawer in the fridge. Plus, for the most part, junk food is cheaper and has a longer shelf life. In an effort to make grabbing a healthy snack easier, I've started keeping a bowl of fruit on the counter or kitchen table. This also helps me to remember that we have fruit that needs to be eaten. We have an older fridge with dark drawers, so once we put our produce in there, it's out of sight out of mind! Also, for me, I like to eat with my eyes. Meaning appearance is a big deal for me when it comes to food. I love fancy packaging when shopping for food and plating my food nicely when it's time to sit down to a meal. So, to make my fruit appealing to me, I pile it up nicely in one of my vintage milk glass bowls or in one of my favorite chippy enamelware bowls. Where I live, I'm surrounded by little towns that set up farmers' markets during the summer weekends. Fresh, local fruits and veggies can often be found for a very good deal. Plus, we have a very large produce store nearby that has very low prices! This week, I picked up a bag of very cute and equally delicious clementines or maybe they are mandarin oranges (? the bag wasn't labeled). They are soooo tiny and very sweet! Plus, they were very cheap! I found them on the discounted produce rack at the grocery store for $1.49 for 18 of these sweet, little snacks! In the past, I was never one to really get excited over Valentine's Day. Mainly because the entire time that Joe and I were dating, I worked at a flower shop. Years of helping others celebrate the holiday was enough for me. Besides, one year, Joe and I did attempt to celebrate Valentine's Day. February 14 fell on a weekend (a Friday, I think) and as usual, I worked long shifts leading up to the day. I also worked the day after, but a shorter day than the rest of the week, so we decided to celebrate a day late. Joe picked me up from work and we went out for an early dinner. I'm not sure if the restaurant was short-staffed or not, but it took a really long time for our food to come to the table. After chatting about our week for a bit, I started to get really tired and by the time our food came out, I was having a tough time staying awake! We realized then, that celebrating Valentine's Day with a date wasn't really an option for us! So, in the years to follow, we just had a low-key dinner at home. Sometimes we ordered take-out, sometimes Joe cooked, sometimes we just had leftovers. Even after I stopped working at the flower shop, we really didn't make a big deal over the holiday. Joe shows me every day how much he loves us and is committed to our family, I don't need one specific day to know how he loves us. When Grace was about a year old, I think is when we started celebrating Valentine's day with her. She doesn't eat chocolate, so Valentine's Day for her meant pink and red cupcakes and a cute stuffed animal, a few decorations around the house and all of her shows having a Valentine theme for the day. Then school started and we were celebrating Valentine's Day in a bigger way! 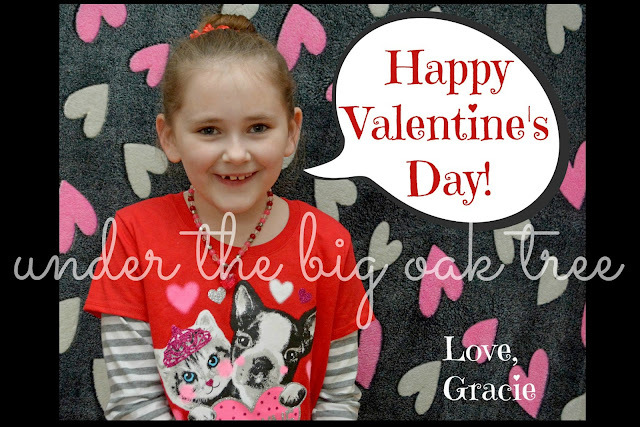 Special Valentine t-shirts, dresses with hearts, parties at school and Valentine cards with candy for the class! How exciting! For the past couple of years, I wanted to do personalized photo Valentines but never got around to taking a picture in order to create the cards. So, when I saw that my friend Kristen (who also happens to be a photographer) was offering an amazing deal on a quick Valentine photo session, I knew I wanted to book a session! Since our family is obsessed with all things Boston Terrier, we were super excited to find this awesome Valentine t-shirt at Walmart! It was the last one and a size too big, but that's okay! She'll be able to wear it again next year! 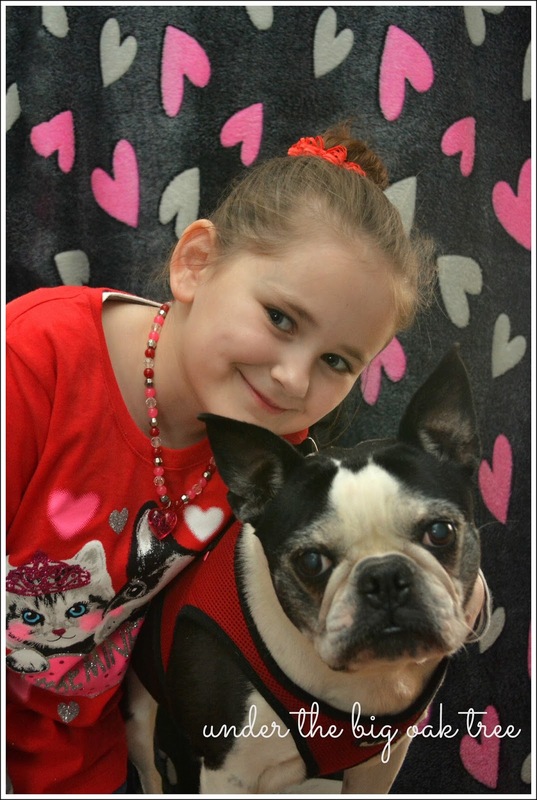 Speaking of being Boston Terrier obsessed, Grace wanted to include our Boston Terrier in the photo session! Kristen is a great friend. She adores Grace and also knows how much we love our dog, Remmy! So she included Remmy in the next shot! Look at that face! Isn't it the cutest?! Oh, yeah! The kid is cute, too! Local readers, if you are looking for a professional photographer at an affordable price, check out KDW Photography & Designs. Here's another photo session of Grace taken by KDW Photography & Designs. Disclaimer: I was not compensated in any way for sharing the link above.